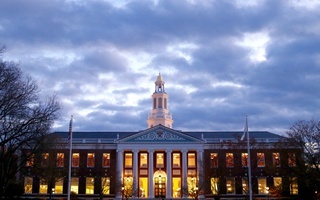 Harvard Business School’s Baker Library at dusk. 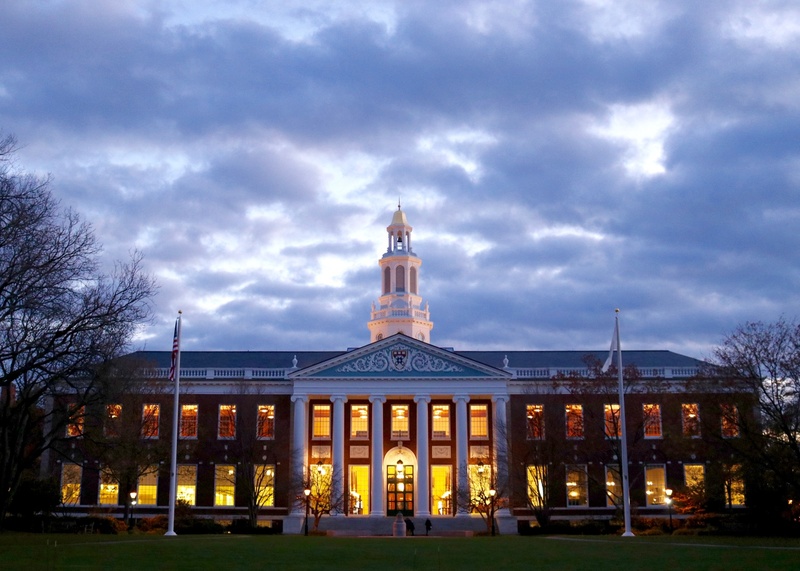 Harvard Business School graduates are increasingly choosing public service careers, and some credit their Harvard education with teaching them management skills applicable to nonprofit organizations and government. 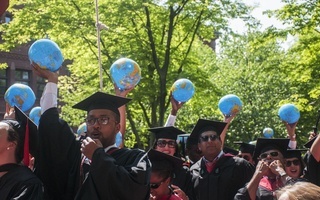 Of the 937 total students who graduated from the Business School in 2017, four percent of graduates entered nonprofit or government sectors, according to the school's career office. The figure represents roughly double the number of graduates who chose those sectors in the class of 2016, as first reported by the Wall Street Journal. Matthew M. Segneri ’04, who received his MBA from the Business School in 2010 and is now the director of the school’s social enterprise initiative, said he has noticed that more graduates are considering entering politics. “Over the last 12 to 18 months, I’ve had a number of conversations with folks and seen a real uptick in the number of people who are thinking about local, state, and federal office,” Segneri said. Segneri said he thinks Business School alumni have always shown a strong commitment to civic engagement and public service. But recent alumni are choosing to get involved with public service earlier in their careers, he said. “When you look at the prior generations of alumni there is more the tradition of learn, earn, and return—folks would go to school, have a successful traditional business career, and then later in life they would pursue public office or get deeply engaged in nonprofits and their communities," he said. "Today, there’s both an urgency and an understanding that it doesn’t have to be that way." Timothy M. Keller, who graduated from HBS in 2005 and was elected the mayor of Albuquerque, N.M. last year, said he agrees that more business school graduates are seeking out public service earlier in their careers. Adem T. Bunkeddeko, who received his MBA in 2017, is one such graduate. Bunkeddeko is currently running for Congress in New York’s Ninth Congressional District in Brooklyn. He did community work in Brooklyn before entering the Business School, and he has maintained his involvement on a local community board while attending Harvard. “I felt compelled, given my background and given my education, to use the skills I learned at HBS to try to make a difference in the community I call home, Brooklyn,” he said. Bunkeddeko, whose campaign focuses on housing, criminal justice, and immigration reform, said he believes his University education helps him most from a management standpoint. “At HBS we’re trained as general managers. Understanding aspects of an organization, whether it be from the finance front or human capital, are important and useful skills that are actually quite lacking in public service today,” Bunkeddeko said. Margaret W. Busse, a 2001 HBS graduate, has also chosen public service post-graduation. Busse is running for Massachusetts State Senate this year and said she has similarly found her business school education valuable to her public service work. After receiving her MBA, Busse worked at a strategy consulting firm for nonprofits. She later got involved on the planning board of her town Acton, Massachusetts, and, for the past two years, she has served as associate director of the social enterprise initiative. Another Business School graduate, Sarah R. Amico, is currently running to be lieutenant governor of Georgia. Amico said she believes the culture at the Business School naturally steers graduates towards careers in public service, whether that be through nonprofits or through public office. “We were consistently reminded that you were going to have a world of opportunity in front of us and a tremendous amount of responsibility should go with that, and part of that responsibility is to leave the world better when you leave than it was when you entered,” she said. Busse, along with several other graduates, said she thinks the spike in HBS graduates running for office is likely related to widespread dissatisfaction with the current political climate. “I’m guessing a lot of people are feeling like me, frustrated with the current situation we have in politics today and feeling their skillset gives them a unique ability to help solve the problems we have right now,” Busse said. Keller named a more specific factor: President Donald Trump. —Staff writer Andrew J. Park can be reached at andrew.park@thecrimson.com.